Halloween has never been the same for me as for people that live in town. When I was growing up out here in the country I had a green plastic witch mask and a horrible black wig. I used it every year. It would scare me if I looked in the mirror, but I just didn't do that and it was fine. There's really only one year I can remember. I must have been about 8 and my brother was maybe 10. My mother let him wear her dark green velvet sheath dress with little pearls dangling around the neckline. She drew two bite marks on his neck with eyeliner and lipstick and he was a vampire victim. He looked AMAZING in my mother's dress. I was really impressed. (My mother has the figure of a 10 year old boy, only with a smaller waist and wider hips, but that wasn't relevant in a sheath dress. Think about it. Thigh gap. Very fashionable.) Then we went out Trick-or-Treating. We got in my mother's VW beetle and drove to my grandmother's house. She was equally impressed with my brother's outfit. She gave us a brownie that we ate there in her kitchen. Then we went to see Cousin Edie who lived down the road. Edie had the nerve to not be home. So we went back to my grandmother's house and looked in the chest freezer on the back porch and found a frozen coral snake. We took it back to Edie's house and put it in the middle of her kitchen table, frozen solid and covered in frost. Then we went home and that was all there was to Halloween. We didn't know anybody else within 15 miles of our house. A week or so later we checked in with Edie to see what happened to our snake. She reported that she was out quite late, giving the snake time to defrost. It looked shiny and pliable and completely alive when she flipped on the kitchen light. She was quite startled and thought it was a good trick. We were very pleased with ourselves. I couldn't help thinking of that Halloween yesterday when my aunt called me from my grandmother's old house, "There's a HUGE rattlesnake under my fig tree. He's as big around as my arm. The biggest one I've ever seen. Do you know if Bruce Means wants him?" "Do you know how to get in touch with him?" said my aunt. "I sure do! I have his cell phone number in my contacts. I'll call him and call you right back." I got Bruce on the phone. He did want that snake, but he was about to go into an important meeting and couldn't come right away. He said to try to put a trash can over it and put a weight on it and he could come later. I called my aunt back. She said her yard men got the snake INTO the galvanized can where she keeps sunflower seeds for the bird feeders. She had to put the lid on before she could take a picture with her iPad because he was trying to come out. Perfect. I could just put the can in my car and take it to Bruce after his meeting. I was going to town anyway to get some hardware for my porch project. Here's the video I made of what it's like to go in the car with a rattlesnake in a can. After I left Bruce's lab I stopped at a friend's office to use his wifi to upload my video. He was visiting with an old colleague who told me that she would have a completely different reaction to finding a rattlesnake in the yard. Capturing it for science would never have occurred to her. Huh. Really? Well that's always what we did with them! As far back as I can remember we kept frozen snakes in the chest freezer on my grandmother's porch. From time to time Bruce Means would come get them. He was in the necropsy phase of his study then, back in the 1970s, and we were good at supplying him with snakes. We had dogs that would find them for us. 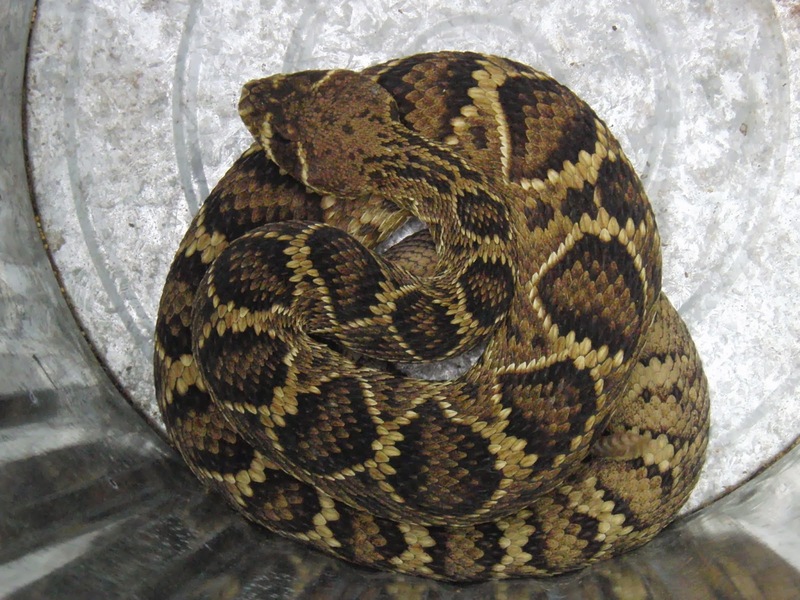 When I moved back to my childhood home in the 2000's and started helping Bruce with his manuscript about the rattlesnakes I realized why I so rarely saw them anymore. I kind of thought they were more rare, that they'd been wiped out by rattlesnake roundups. That's part of it, but I think it's more because I don't have a dog to point them out to me. They are extremely hard to see and don't WANT to be seen. They REALLY don't want to go in a can. It is hard to recall in hindsight how we decided which snakes to kill and which ones we left alone. We certainly didn't kill every rattlesnake we saw. If we were out in the woods and the dog started barking at a rattlesnake we would just call off the dog and make her leave the snake alone. If it was in the yard I guess we would kill it so we didn't have to keep the dog inside all the time. We once had a Doberman Pinscher we got from my mother's English professor. It had been to obedience training school. That dog had a very long attention span, like that dog in Fletch. Just didn't give up. She would bark and hassle a snake until it bit her. We took her to the vet three times for antivenin, twice for rattlesnake and once for moccasin. We had a German Shepherd who would turn her back on the snake and bark at me and my brother to get away from it. She was never bitten. In the dog and snake in easy range of the house scenario my mother would usually get a shotgun and come out and shoot the snake. And we'd give it to Bruce Means to dissect. Now it would never occur to me to kill a snake. I just take their picture and make a video and leave them alone. It's nice not having a dog to worry about. I think the risk of getting bitten while you're trying to kill a snake is higher than when you're making a video of it. And if you don't know somebody doing a necropsy study of that species it's certainly a waste of a perfectly good rat-eating machine. I have serious issues with mice and rats messing with my stuff. I have never had a problem with a snake tearing up any of my property. I like them alive.